There have been several claims that the Ark has been found. Some believe it is in a cave in the desert, others claim it is in a church in Ethiopia and some believe it is right underneath the Dome of the Rock in Jerusalem. Jews still to this day pray at the famous Wailing Wall, towards the Temple Mount where their temple once stood with the Ark of the Covenant. Now the Muslim mosque is in the very place where the Jewish temple once stood (or very near), which creates a lot of tension between Jews and Muslims. What was the Ark ? WHAT IS THE ARK OF THE COVENANT ? In the Bible the Creator of the earth asked the people of Israel to make Him an earthly throne. 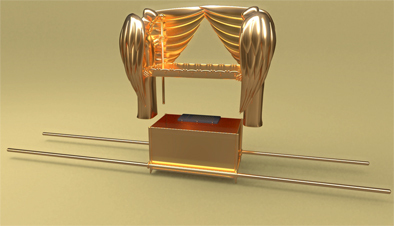 This throne was called The Ark of the Covenant. The God of Israel told them to build the Ark of the Covenant in two different pieces. 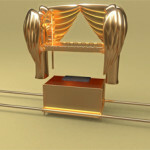 One part was called the Mercy Seat which the two cherubim were connected to, and the other part was called the Ark of the Testimony, after God’s testimony, namely The Ten Commandments, that were placed in the box. So the box is the foundation of the throne. These two pieces were to be put together, and thus we have the Ark of the Covenant. Please take the time to read the whole description in the Bible. I’ll give you a reference so you can read it yourself and I’ll just introduce the most relevant details here. It’s found in the book of Exodus, chapter 25:10-22. The Ark was to be made of shittim wood and then overlaid with pure gold, with a crown of gold around it. The staves were also made of wood and overlaid with gold, and were detachable from the Ark. Then the tables of stone were placed into this box. The Ark was 2.5 cubits long, 1.5 cubits high and 1.5 cubits wide. The Mercy Seat was not made of wood but of pure gold; both the seat and the two cherubim. Firstly we are told that, “the cherubims shall stretch forth their wings on high, covering the mercy seat with their wings, and their faces shall look one to another; toward the mercy seat shall the faces of the cherubims be.” Exodus 25:20.